The Louisiana peasant who became Louisiana’s king is on view in his Capitol in his coffin today. The face which in life never held the same expression for more than two seconds is fixed in a studied smirk—an undertaker’s idea of how Huey Long should have looked. Here, set forth in a dinner suit, is the man who sold lard substitute to hook-wormed sharecroppers. The shirt front is as smooth as a planed board, as white as a jailbird’s face. The black tie flares with the nonchalant perfection of a drawing in a fashion magazine. You look down at it for the brief moment that the guards, uniformed and plain clothed, permit. You can’t believe that here is anything but a bad wax sculpture of a super-humanly alive man—and painted at that. It is so much like one of those figures you see in store windows which remind you of somebody, but you can’t be quite sure of just whom. Huey wouldn’t have liked it, and his words wouldn’t have been fit to print. The setting is superb. When Huey Long decreed the building of a new State Capitol he specified it should have an entrance hall that would impress people, all kinds of people. It does impress. Brass doors with bas-relief of such historical happenings as the defeat of the British by Andrew Jackson; huge Sevres vases, the gift of France to its former possession, Louisiana; mural paintings in fine and subdued colors; a high and delicately tinted ceiling—don’t let anybody tell you that it isn’t an ornate rotunda. Last night people flocked to see the genius the State has produced. But it was a surprisingly small crowd. A fraction of the Long office-holders of this capital city would have made a larger one. About 2,000 waited. True, it was drizzling, the hot, weakening drizzle of the Louisiana swamps, through the afternoon. But when, according to the widespread information, the Kingfish was to be seen lying in state, the crowd was still small. This reporter became a part of the crowd. He wanted to know what was being said by the man in the street and the man on the dusty rural road. In short, this reporter didn’t hear a single reference to Huey Long or his policies. This reporter hazards no guess as to the meaning of last night’s lack of enthusiasm. He merely reports that the crowd was much more interested in the fact that movie men were taking a picture of the scene than in the fact that a great man of their State, the man who would make Louisiana the Empire State, was no more. Some laughed and waved to friends, others pushed and shoved exactly as they would at a bargain sale. The mourners’ line curled into the front door and past the coffin. As they departed they had to go past a half dozen carpenters who had opened their kits and spread their tools on the expensive marble floor of the rotunda. They were building two wooden fences to keep in line the crowds moving slowly past the coffin today. Outside there was a clang of picks and spades. Grave diggers were hacking away at the turf in the sunken garden outside the Capitol. “It’s unlucky to leave a grave open at night,” a man in the crowd muttered. National Guardsmen, unarmed but straight and tall in their brown uniforms, stood guard at the coffin. 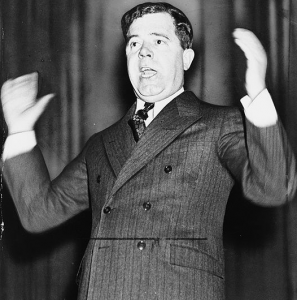 The wall behind the casket was smothered with flowers, and they, too, were a sort of history of Huey Long’s life. “Eleventh Ward of New Orleans,” read a gilt ribbon across a cluster of roses and asters. “New Orleans Clearing House Association,” proclaimed another one. Earlier, Mrs. Long, swathed to the chin in dark, melancholy blue, went to the funeral parlor and came out dabbing her eyes. Her daughter, Rose, twenty, and a younger son, Russell, walked by her side. Rose clenched her handkerchief in her right hand. High officials of the State Government, including Governor O. K. Allen and Speaker Allen Ellender, visited the funeral parlor, too. But the scene in the rotunda was for the people who did not know Long—people who probably never saw him except in death. Farmers, red-necked from the sun and with the mud of bayous caked on their boots, stood in line in the rain for a two-second glimpse at the coffin. The high French heels of young girls, going clickey[CE1] -clack across the marble floor, challenged the din raised by carpenters. Generally, Long’s enemies stayed away. Some of them were in the crowd outside the Capitol when the body was brought from the funeral parlor. They took off their straw hats, limp and drooping from the rain, as the coffin was carried up the sweeping flight of steps. One of the first persons past the coffin was Mrs. Josephine Fohn of New Orleans, an elderly woman in a shapeless brown dress. At the neck of her dress sparkled a pin—a gilt ornament in the shape of a fish. On the fish’s head was a crown. Rap, rap, rap, went the carpenters’ hammers, and still Mrs. Fohn talked. Now Mrs. Fohn was abreast of the coffin. There was steam on the lenses of her horn-rimmed glasses, and she brushed at them angrily. Mrs. Fohn took a quick look at the coffin and doddered out into the rain. The crowd swallowed her. Inside a carpenter whistled and pounded a nail. This entry was posted in Contributor Samples, Top Columns. Bookmark the permalink.